Squid's Built-In Light to Inspire New Gadgets? 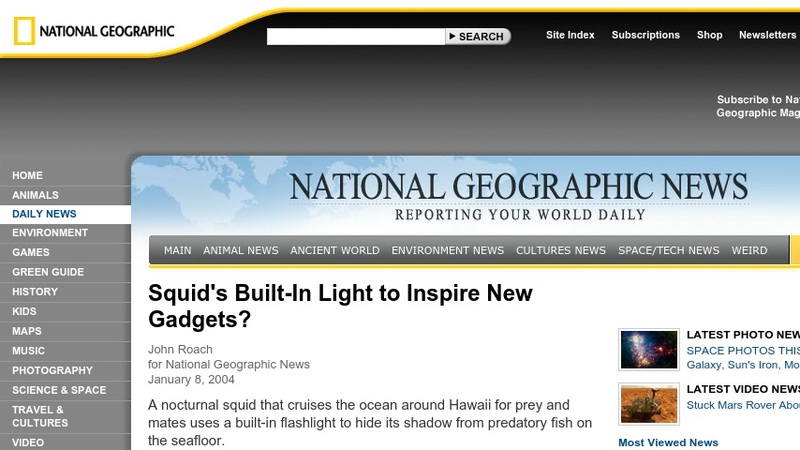 This National Geographic news article describes a type of nocturnal squid found in the ocean around Hawaii which mates using a built-in flashlight to hide its shadow from predatory fish on the seafloor. Its unique light organ - composed of stacks of silvery reflector plates that surround colonies of luminescent, symbiotic bacteria - may inspire a new generation of high-tech miniature gadgets. This 2-page article includes links to related articles and additional National Geographic resources.